New research slated for publication in Physical Review B shows that “cold spots” can be localized within a molecule, leaving single atoms with temperatures near absolute zero, while other parts of the molecule rest around a comparatively balmy 100 Kelvin. What Can a Blob-eating Game Teach Us About Biblical Plagues? 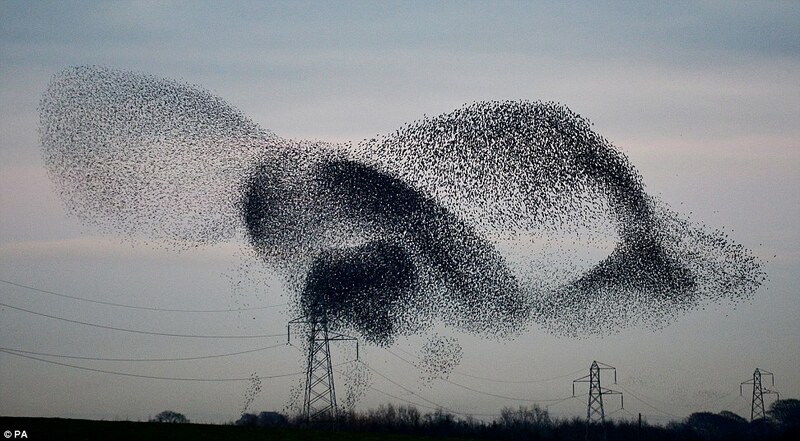 Swarming behavior has always fascinated physicists, biologists, and behavioral scientists alike—as well as anyone who’s seen a sky-darkening flock of starlings twist into its mesmerizing shapes. It’s hard not to wonder how such elegantly concerted behavior arises on the fly, or how on earth the birds keep from running into one another. But birds aren’t the only things that swarm like this, and while the idea of The Birds acting as a collective is scary enough to merit a Hitchcock film, this might just be a psychological sublimation of the instinctive fear of a very real and far-more-threatening swarm: Locusts. Now, research from the University of Bath gives us some understanding of how this swarming behavior happens in insects, and how we might disrupt it. "Imagine a tube structure stretching a large distance (say a light year) encasing a row of ballbearings that are lined up inside the full length of the tube. If I push one more ballbearing in from one end, would a ballbearing at the far end instantaneously drop out? Or for millions of years until the information is transferred would there be more ball bearings than the tube would normally fit? Or would it simply take me millions of years to push an extra ballbearing in the tube?"